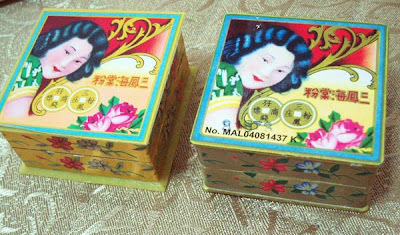 The super old school Sam Fong Hoi Tong powder by Sam Fong Cosmetic Co. Hong Kong. I like the packaging, it's so cute! It's amazingly still around without any changes to the packaging. And it only costs S$1.00 (about US$0.65). Our grammas and great grammas used these cuz as my mom said, they didn't know how to use western cosmetics (liquid foundation). This together with paper rouge. Actually it's just a white slab of calcium carbonate. And they say it makes your skin white (by that I think they mean fair but it makes you geisha white too). You can add water and use it as a mask. Some people use this to polish silver like how some people use baking soda to clean sterling silver. I have 2 boxes at home. Not too sure if one is illegitimate or a parallel import but the differences show. The left one is the Hong Kong one which I bought from a Chinese medical store (Chinese instructions) and the right one is Indonesia/Kuala Lumpur import (English instructions) which I got from a makeshift store in a bazaar. The left one looks nicer of course. The side papers are gold shiny papers. That's a whole lot of difference lol. The Hong Kong one is much smoother than the other one (which is grainier), and slab sizes are different. This may not be important unless you are allergic to the parabens? It's effective at keeping your face less oily in humid climate, but wear it at home lol. Or wait till the white is absorbed before you go out if you don't want to look like having flour on your face. I googled it and found places mislabeling it as rice powder... I wish it were! Unless calcium carbonate is rice powder... neh. And these sites are Ebay stores: some sellers probably copy-paste without verifying. Edit: Well I have been getting a lot of emails and views on this post, thank you! Yes there is a pink tinted version although it is very pink so I did not bother to try. I think they are the ones that come in the pink plastic cases. Ingredients and country of manufacture are unknown, maybe I'll update this post if I come across any. I currently don't use this anymore, though they are more readily available in Singapore stores. I think talc clogs pores and so have changed to something better - silk powder. 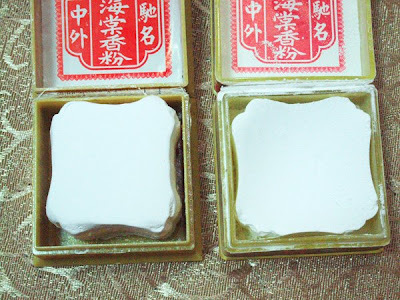 The same brand that is tinted several different colors that does contain rice starch by sam distributed by palladio, which are the ones labeled as rice powder. Same cube design with the same lady on the logo but not as ornate a box. I bought the HK one from a chinese medical hall! Wow! Did you get this in singapore? Which chinese medical hall did you get it? Try serangoon gardens, last I looked they did not have it. 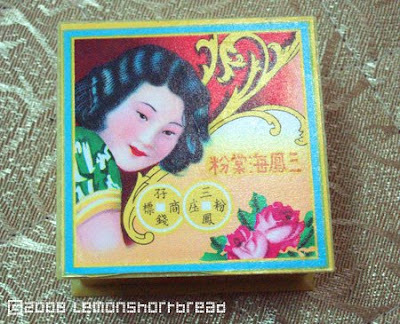 I don't know anymore if I ever used the powder, but I bought one box with the same appearance in Singapore in 1977. I'am a graphic designer and I kept the empty box for all those years now. Do you want to see it? The provision shop at Blk 115 Commonwealth Crescent (Singapore) is selling the white at S$1.20 if anyone is interested. It's available at sheng Siong supermarket as well. I bought mine from Indonesia's morning market at Rp 3,500. But after using, found it too rough. Then I bought the ones made in Hong Kong at local grocery store in Penang at RM2 each. The texture is really smoother this time. I found the pink one today at basement Gurney Plaza,Penang selling for RM3. Even though the box is exactly the same made in Hong Kong, there is a label saying it is Made in Thailand. Can anybody explain this? Also, does talc really clog pores ? Since it does contains talc, I am worried if I use it daily to replace my loose powder. But my mom and grandma have been using them. Their skins r smoother than me. Wonder why? Does anybody know if the process of making this powder still same as olden days? I think talc do clog pores depending on your skin they may or may not have an effect. I avoid them as much as possible. i just bought it in my house area. made in Thailand. I wonder the different until i found all this in your blog. it not really fine and to easy to crack. thanks for sharing. FREE DIGITAL STAMP - It's Cold Out Here!